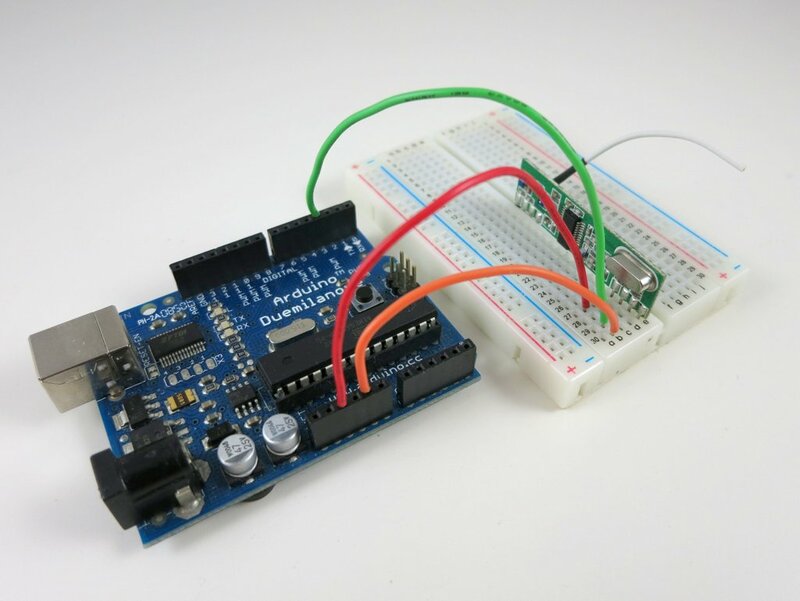 Continuing from Part 1, this is the second post about how I reverse engineered a few off-the-shelf wireless temperature, humidity, and rain sensors, and used an Arduino to listen to and decode the sensor data. Update: RPi is also supported now! Check the provided programs at the end of this post. Raw Waveform. The second sensor to tackle is the Acu-Rite 00592W3 humidity / temperature sensor. This one transmits not only temperature but also humidity values. The display unit is a lot larger and looks cooler than the previous (temperature-only) one. Cool, time to get hands dirty. Following the same procedure as before, pop in the battery, power on the RF sniffing circuit, and launch the Audacity recording software, I got a waveform like the one shown on the right image below. Each transmission consists of 3 repetitions of the same signal. Every two repetitions are separated by a sync signal defined as a constant low of 2.25ms (about 100 samples @ 44.1kHz sample rate). This is followed by 4 squarewaves of roughly 1.2ms wavelength. The bit patterns are also clear as there are only two types of patterns: logic 1 is defined by a constant high of 400us followed by a constant low of 225us; and logic 0 is defined by a constant high of 250us followed by a constant low of 400us. Given the timing data, I quickly modified the Arduino program to convert this signal into bits. The only changes are how the sync signal is detected, and how the bit 1 and 0’s are defined. Because the data was recorded as the temperature went up, the first byte is clearly showing the right trend: it goes up as the temperature rises. These are probably the most significant 4 bits. The next byte is not very clear at all: sometimes it goes up, sometimes it goes down. What’s happening here? The last byte is even more elusive: but given my experience with the first temperature sensor, this is probably some sort of error checking code, so let me put it aside for now. The second byte still doesn’t show any clear trend; but the first byte is still well behaved: it consistently increments as the temperature rises. That’s re-assuring. I then noticed something very interesting, and that’s why I used dotted lines to separate the data: each dotted line marks where the first byte increments by 1. If you look at the temperature where these changes occur, there is an interesting pattern: the change occurs roughly every 12 degree Celsius. From my experience with the first temperature sensor, I know that it’s likely the data reflects 10 times the Celsius, so that means the change occurs at about every 120. This is very close to 128. If this is the case, then the lowest bit of the first byte must be the 8-th bit of the actual data (that’s how one bit of increment corresponds to a change of 128), and thus there must be 7 least significant bits following it! Could that be from the second byte? The single arrow points to the decimal value of the 11-bit number. There is obviously an offset of 1024, so I subtracted the value by 1024 and then divided it by 10. The result is shown following the double arrow. Now we are almost done. If you compare the result with the reference temperature, there is still some difference, like a 1.6 to 1.9 degree constant shift. This is probably due to calibration. The shift seems consistent, so I picked 1.9 as an empirical number. Putting everything together, the temperature is calculated as: [(11-bit number – 1024) / 10 + 1.9] rounded to the nearest integer. At this point, the last byte is still a mystery — as I said, it’s likely some sort of CRC checking code. Perhaps the experts can shed some light here? Arduino Program and Validation. It’s now time for the final test. Here is the Arduino program that listens to the transmitter and displays the humidity / temperature value to the serial monitor. The result matches the display unit quite well. Cool. Mission accomplished! Continue to Part 3 and Part 4, or Back to Part 1. I can give you the nudge to finish off the protocol: the checksum looks to be the summation of all of the bytes in the message. Ah, that makes sense. So this solves the last piece of the puzzle 🙂 Thanks. Actually I am curious: the summation would easily exceed 8 bits, so how come this is used, instead of doing something like XOR (i.e. parity). The simple answer is the summation does exceed 8 bits, but if you sum it to an 8 bit value, it’ll just roll over once you add past 255. When calculating checksum it likely rolls two or three times, but what you end up with is a very simple means to calculate a check. I am just starting out with Arduino, and my coding skills are average at best (hope to grow with both). This project with the Temperature and Humidity is wonderful! 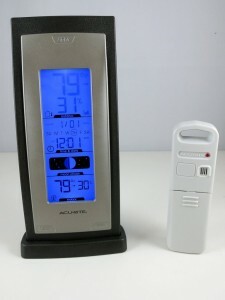 I went out and bought the Accu-Rite Temp Humidity sensor, the arduino and the Receiver you specified. It seems to work great until the temperature falls to 0 deg C or below, then I get some kind of “rollover value” that is very large and very wrong. (The humidity continues to register correctly). I am using your code as it was written. Do you have any advice for me to fix this? And PS, keep up the awesome work!!! As you can see from my analysis, the code is supposed to handle negative values. But perhaps the sensor you have has changed the encoding scheme for negative values. You will probably have to follow my reverse engineering method to find out how the signals are encoded in the negative range. I spent some free time this weekend using a bit level sniffer, and agree with you that the bit pattern is as you reported it. What I finally figured out that solved the issue (and gave me temperature out to 2 decimal points is that the arduino UNO is having trouble with INTEGER math. It should have worked the way you wrote it, but below 32 deg F, it didn’t. The issue was with subtracting 1024 from the result of the temperature byte. I was able to get around it with the following (Very Minor Modification to the code). Since Humidity is always 0-100%, there was no need to convert that to a floating point. // added this code to get readings below 32 F.
Thank you so much for all the work you did on this project decoding the devices, I plan to use this in a remote home environmental monitor and control system. For positive temps what is displayed is the middle two digits of calculated decimal number. 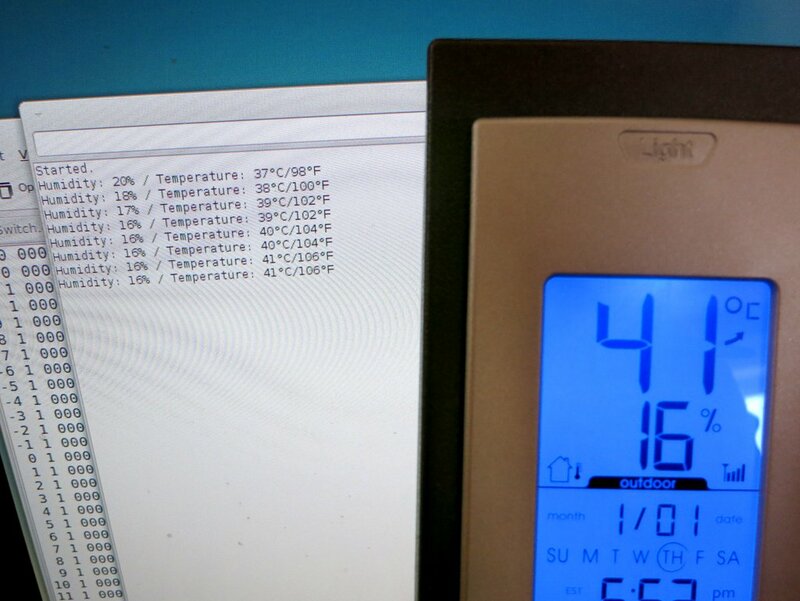 So the temp displayed is int((temp-base10/10)-100). My guess is the last digit is valid just not used by the display so if we use float((temp-base10/10)-100) you should have accuracy to the tenth of a degree with no odd 1.6 to 1.9 required. This is a fantastic write-up, thank you! I was able to get several Acurite and LaCrosse sensors and use the information here to get the data into Arduino. It is possible to receive values from several thermometer brands but doing anything else in Arduino besides reading and processing becomes prohibitively time consuming. 1. The signal from the thermometers is sent as specific 1s and 0s, but the code ignores that distinction, it only uses the interval timings. 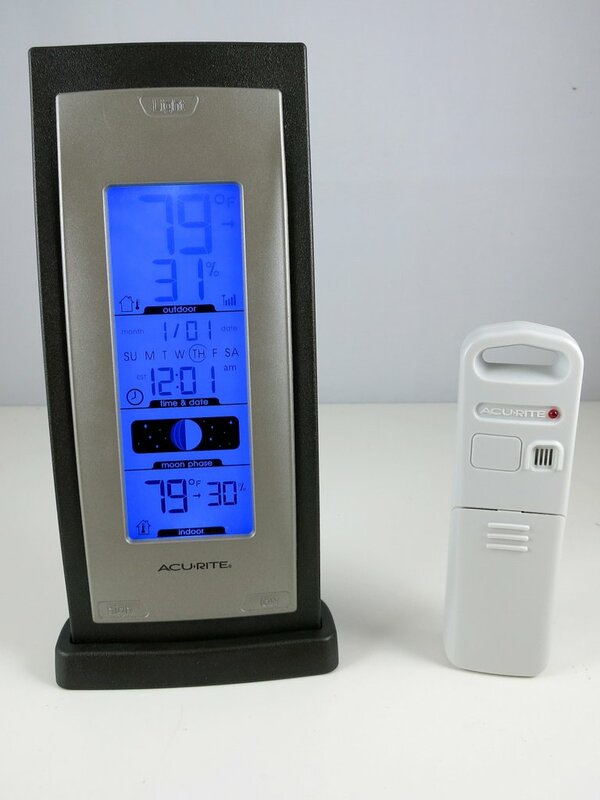 While this works OK for Acurite, LaCrosse brand thermometers send nearly identical interval values so distinguishing between 1s and 0s become important. I tried using separate ring buffers, structures, using the highest bit of the timing interval to store whether the signal was in 1 or 0, but the lowest memory was assuming that all even slots in ring buffer are 1s and all odd slots are 0 (they always alternate). If the signal becomes out of sync, skipping a slot in the ring buffer to get the signal in sync is simple. 2. Some error checking is also required. This could be using parity, CRC, comparing retransmissions. Without error checking there will be times when the temperature is received incorrectly or the thermometer ID is wrong. Can be important if you want to do logging. 3. You can use more than 3 thermometers at once. A part of ID is being randomly generated when the batteries are inserted, so the likelihood of ID collision is minimal. 4. The temperature is sent in (T_Celsius – 1000)/10. The thermometers are fairly precise, keeping a decimal can be useful. 5. Acurite temperature sensors may have or not have the humidity information but the sent message will be identical. This is set by jumpers inside the thermometers. Cool, glad to hear the blog helped you, and thanks for sharing the tips. 1. I removed the delays from the code. This allows getting multiple repeat transmissions and compare the CRC in them. Discard all the corrupted ones, but since there are duplicates that we can read, the probability is higher that at least one out of several rebroadcasts is good. 2. The duplicate reads from the same sensor are removed by comparing the time stamp from a given sensor ID of the last good transmission. 3. The third byte in the “signature/channel ID” is the battery status of the transmitter. It can take any two values: 0x44 for good battery and 0x84 for low battery. Maybe there’s something else in this byte. 4. I changed the logic after the first sync is received. Instead of waiting for the second identical sync, wait for the longer pause (say, 3x the SYNC_LOW) to determine the end. This is more reliable and allows reading the duplicates. I’m still not sure how to determine whether the transmitter is sending humidity information. My transmitter does not have the humidity information and fourth byte is always 0x10 (disregarding the first parity bit that is set). This translates to 16% humidity, but there must be a bit somewhere in the ID that tells whether the humidity value is valid. The first two bits of the ID are the channel set by the hardware switch A=11, B=10, C=00. The rest of the bits seem to be randomly set after batteries are inserted. Great work. I added a few lines to serial print the channel ID, putting them before the humidity. Thanks for the great work decoding and documenting this. I’m wondering if you can provide any device or direction on the really inconsistent duration timings I’m getting. I’ve set up a sniffer circuit like you did and things look good with it, however both my arduino and raspberry pi (v3) provide really inconsistent timings that don’t really match the timings I’m seeing via the sound card input. The sound card input shows very consistent timing. I’d say on average 1 out of every 5 readings into the arduino or rasp come in accurately. I’m fairly new to this and wonder if I’m missing something, or if I need to add some additional circuitry to improve the reliability. I am wondering if it has to do with the reliability of your sniffing circuit. You may want to try the RFToy (rayshobby.net/cart/rftoy) which has a built-in sniffing circuit with audio-out jack. I tried many things, but I am unable to receive the sensor signal. I have there a rtl sdr receiver, with rtl_433 utils I am able to receive the sensor signal, but only from a very limited distance (1-2 cm). Can we figure out from the log these values? I don’t know what else could be the problem, does anyone have an idea?